The month-long conciliation talks between nurses and their employers have not borne any fruit, the Nation has learnt. After the health workers went on strike, the Council of Governors moved to court, which ordered the parties to attend conciliation meetings initiated by Labour Cabinet Secretary Ukur Yattani and file a report within 30 days. Mr Yattani appointed a committee comprising representatives from the Health ministry, Council of Governors (CoG), nurses' union, Labour ministry and Public Service Board to look into the issues. 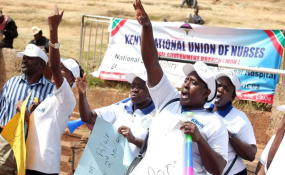 It has however emerged that the ministry of Health and CoG, despite signing the return-to-work formula, insist they do not have money to pay nurses. The talks ended last week and the team is compiling a report which will be filed in court on April 16. "The Ministry of Health, governors and nurses' union leaders did not agree. There was a lot of dishonesty. I know there is a lot of expectation from nurses that maybe they would be getting a salary increase. Unfortunately, I have to inform them that we disagreed," Ms Agnes Munderu, Kenya National Union of Nurses' national treasurer, said. Meanwhile, KNUN has since received interim orders directing Kajiado and Kisii counties to continue deducting and remitting union dues. The two orders, issued separately, have also directed Kakamega Governor Wycliffe Oparanya and Kisii and Kajiado counties to pay KNUN Sh468,600 and Sh199,800 respectively of undeducted union dues for February and any other subsequent month. It is only Kajiado and Kisii counties that failed to deduct the dues while other devolved units deducted less than the gazetted Sh650. "We don't understand what counties want. Kisii and Kajiado did not deduct anything while others, including Kiambu, deducted Sh1.50 only from each member. Other counties deducted Sh300, contrary to our standard amount, which is Sh650," Ms Munderu said. This followed a February 15 directive from CoG asking counties not to remit money to the union. "We are simply asking the counties to implement the order failure to which they will pay the union dues from their own kitty," she said.